We’re wrapping up 2017 with one last tutorial post! 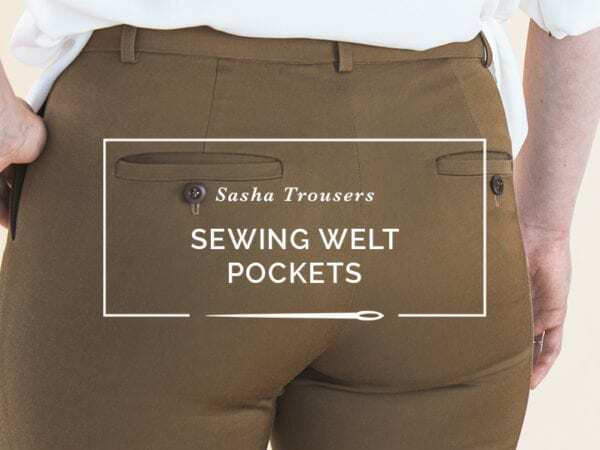 Our Sasha Trousers feature chic slashed pockets with a pocket stay extending to center front, which helps create a beautiful smooth line at the waist. 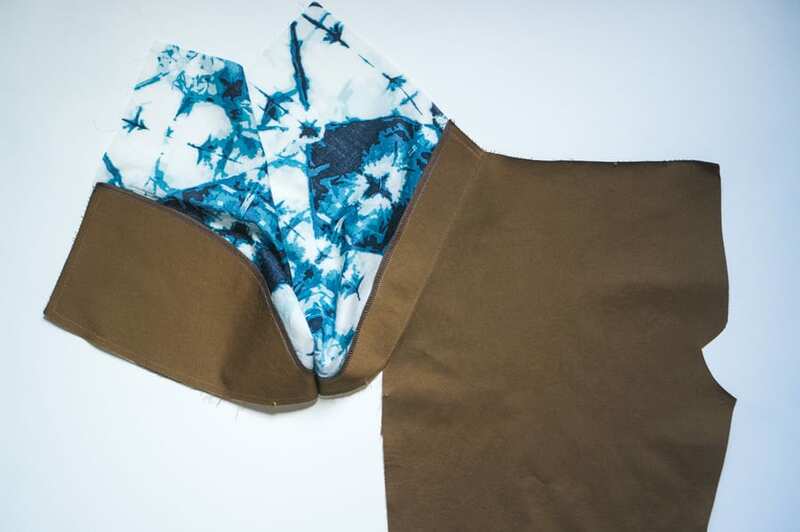 They look very sleek and are a lot easier to sew than the front slanted welt pockets we had originally designed for this pattern (make sure to check in with our welt tutorial for the back pockets). 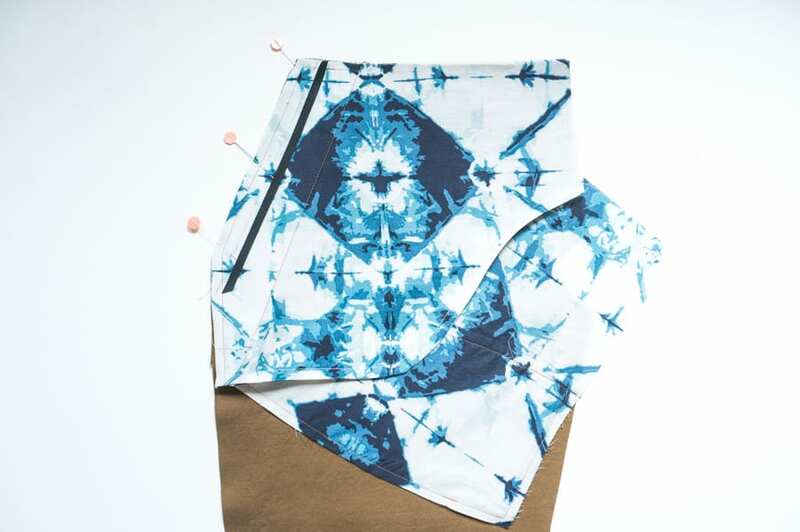 Heres’s how to sew them! 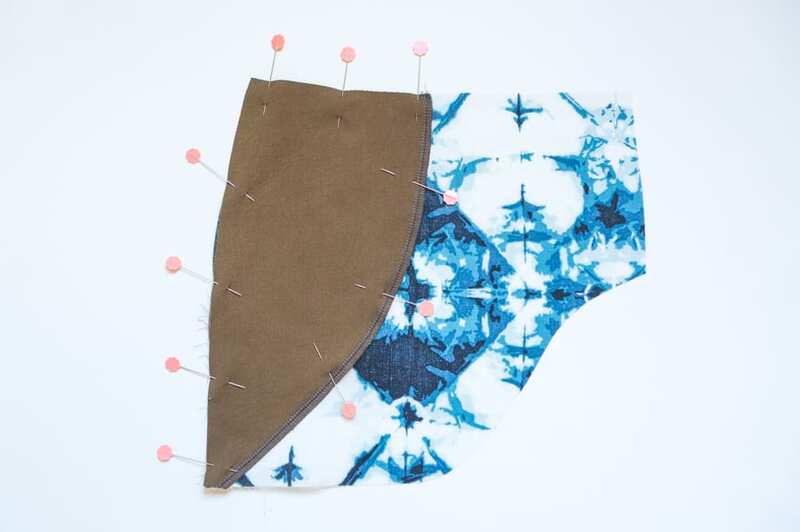 Start by finishing the raw edges of your front pocket facings with either a serged or a zig-zag stitch. The inner pocket facings (F) should be interfaced, and you will serge along the longest straight edge of the facings. For the outer pocket facings (E), you will serge the long curved edge. Now we’ll sew the pocket facings to the pocket lining pieces. If you go to the effort of choosing a pretty pocket lining, it makes no sense to hide the right side of the fabric inside a pocket where no one will see it and the sun doesn’t shine! For this reason, we will make sure the wrong side of the pocket lining will be inside the pocket, so you can see the right side of the fabric when you go to put on your trousers. With the wrong side of the outer pocket facing placed against the wrong side of the bottom pocket lining (G2), position the facing in the top corner of the lining and pin in place. 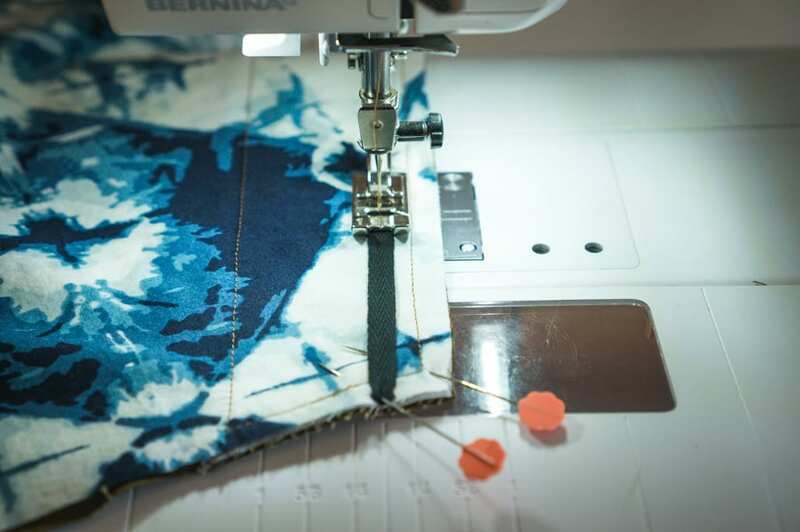 Sew all around the facing 1/4″ from the edge; you may want to sew 1/8″ from the edge along the serged side. Repeat for the inner pocket facing. With wrong sides together, match the inner pocket facing to the top pocket lining piece (G1) along the slanted edge. Pin in place and sew 1/4″ around the perimeter of the facing. 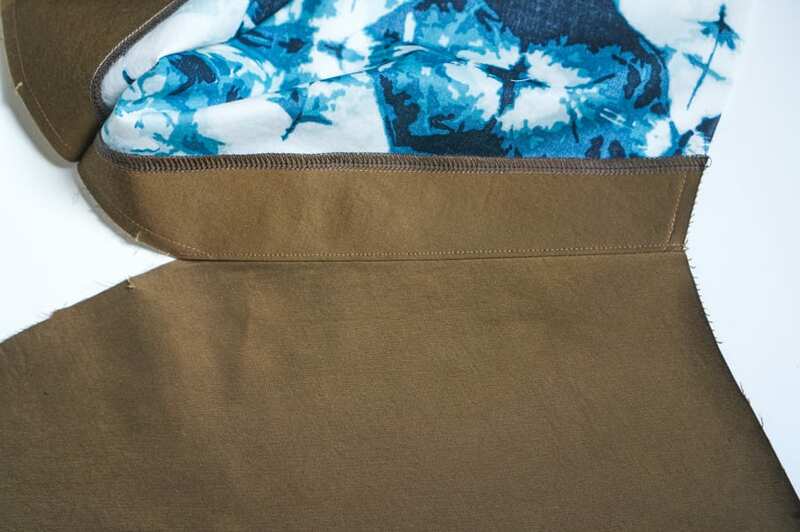 We like to close the pocket bag with a nice french seam. 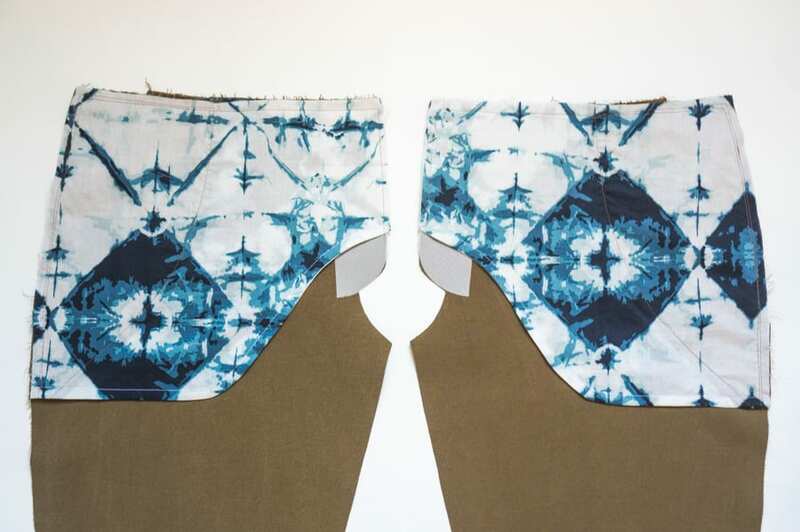 With right sides together, match the top and bottom pocket lining pieces along their curved edges. Pin and sew at 1/4″. Trim the seam and turn the pocket bag right side out. Press and sew along the same curved edge at 3/8″ (you may need to clip the curved seam so it lays flat). The pocket is starting to take shape! 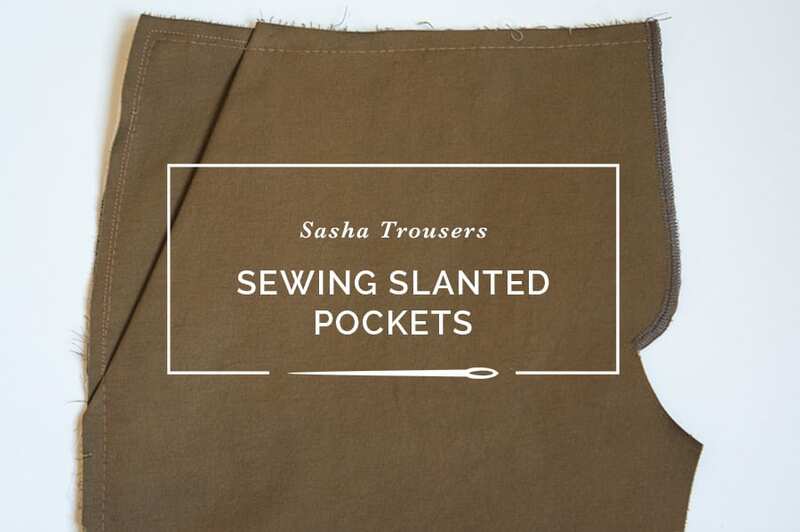 Open the pocket bag and line up the slanted pocket opening with the front trouser leg. 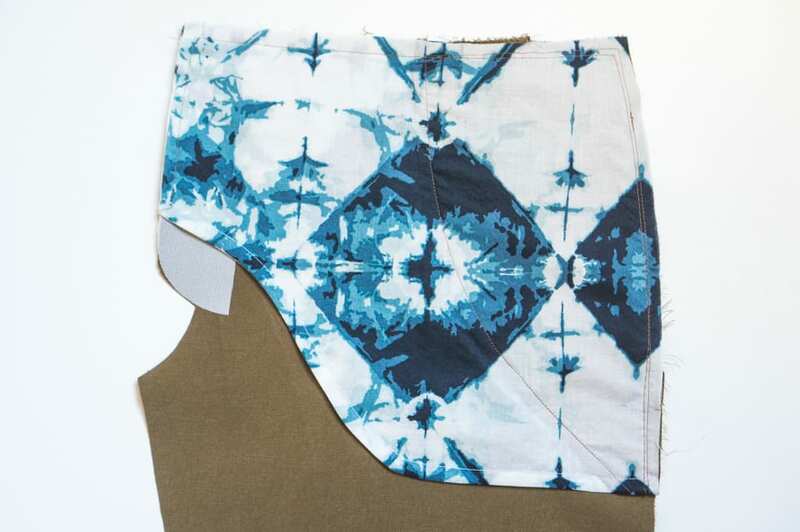 The right side of the inner pocket facing will be against the right side of the leg. We have a special trick to help prevent these finished front pockets from gaping when worn; sewing lightweight twill tape to the seam helps stabilize it. 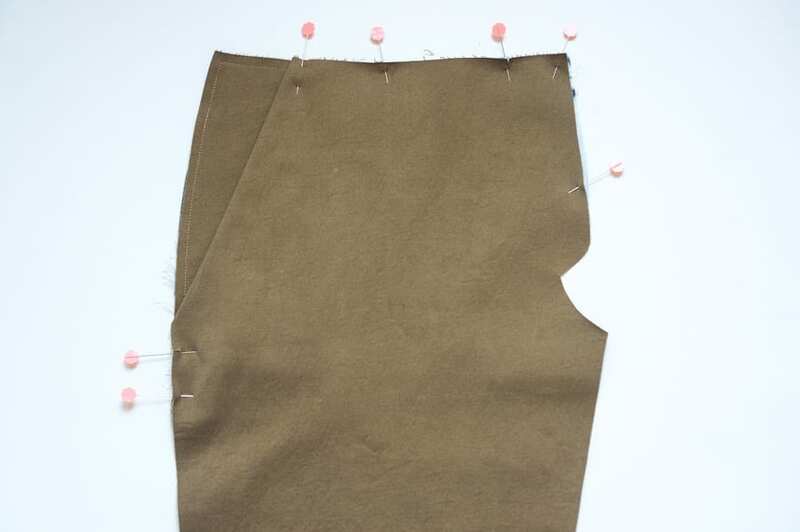 Cut a length of twill tape that is about 1/4″ shorter than the length of the pocket opening and pin it in place at the beginning and end of the seam line. 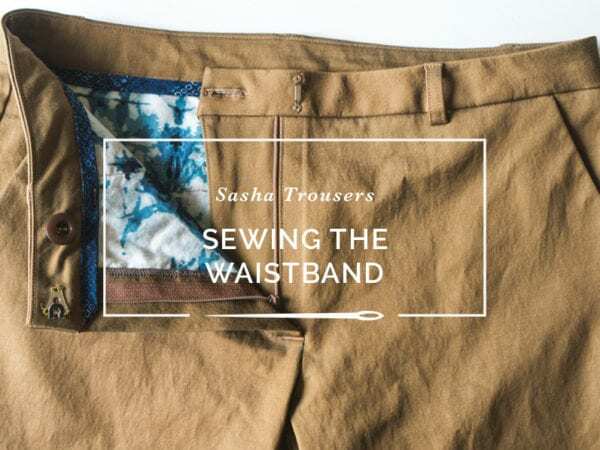 Stitch the inner facing to the trouser leg at 5/8″ seam allowance while carefully aligning the twill tape under your needle and easing the tape so it stretches to match the length of your seam. Adding some tension to the twill tape will help the pocket lay flat later. Open the seam and press the seam allowance towards the pocket bag. Understitch the inner facing to the seam allowance and grade. This is what the pocket should look like so far. 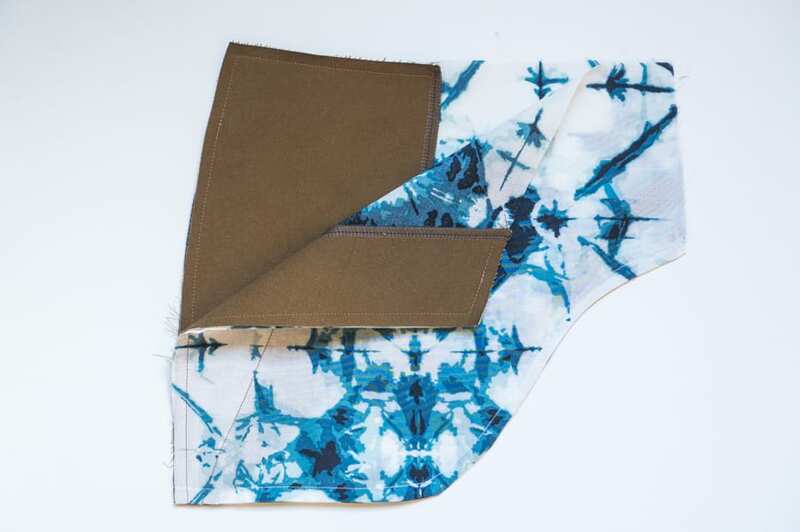 Remember the wrong side of the pocket lining fabric should be inside the pocket! 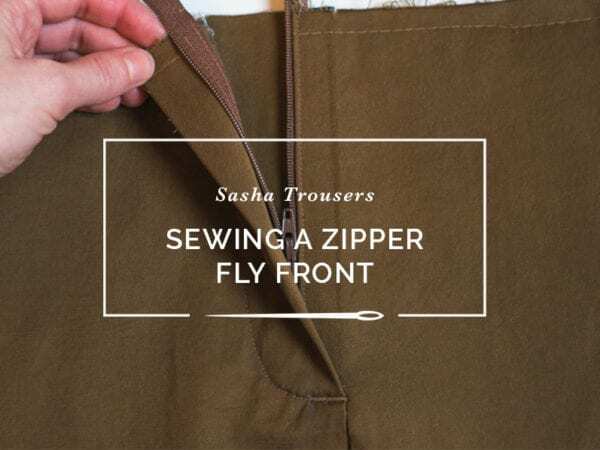 Press the inner facing to the inside of the trousers along the slanted edge of the pocket opening and pin the pocket bag in place along the side seam and waist, matching notches. The outer pocket facing should be in place at the hip. 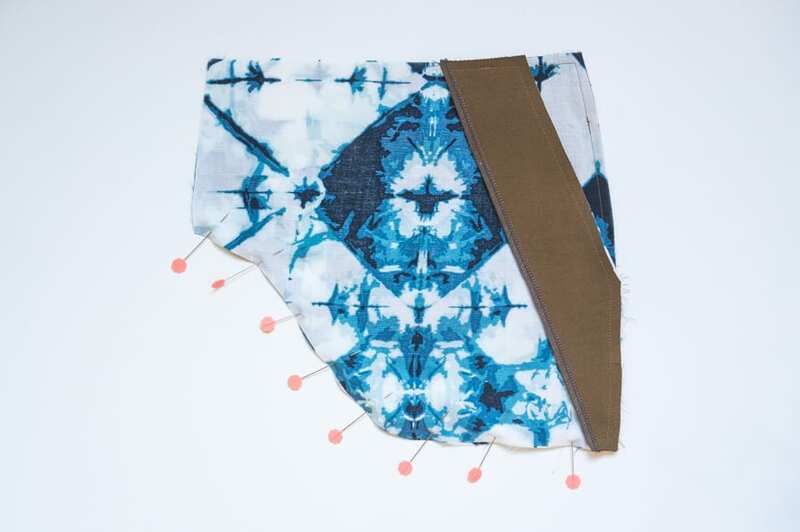 Baste the pocket bag in place along the fly extension, waist and side seams, sewing just within the 5/8″ seam allowance. 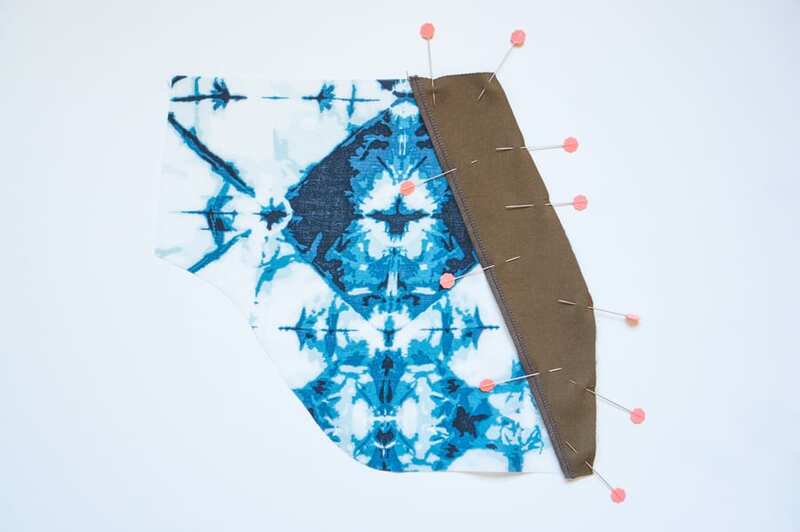 Repeat the steps for the opposite trouser leg and admire your pretty lining fabric! 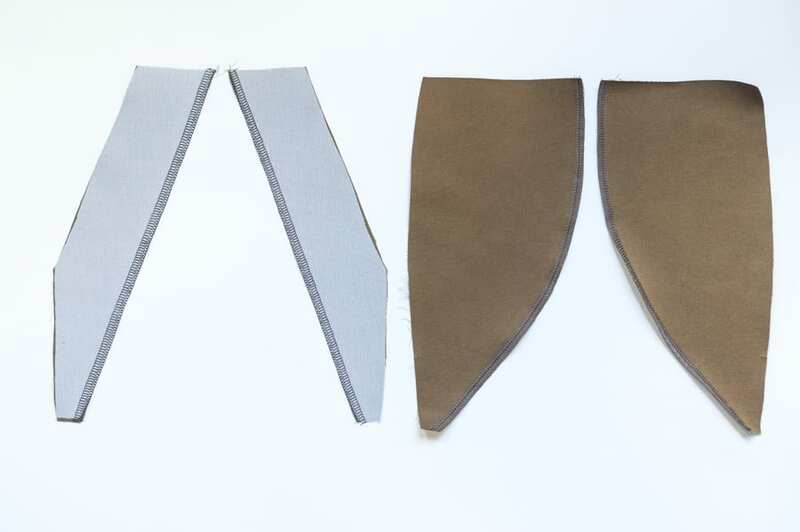 We still have a few posts on sewing a fly front and waistband for pants and trousers; these will be coming your way in the New Year!